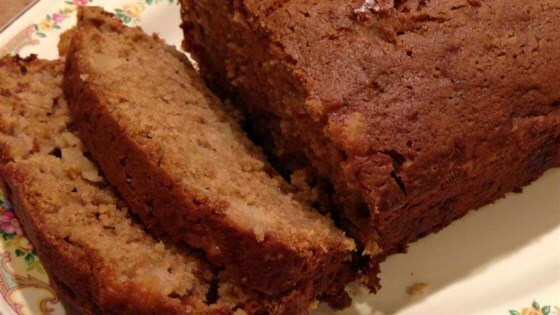 "I was given this recipe years ago by my friend Debbie. I've had it written down on a torn piece of paper for years and decided today that this recipe needs to be on AllRecipes. It is a moist, sweet, and delicious bread with a crispy crust. By far my favorite bread recipe!" Beat eggs, sugar, vegetable oil, and vanilla extract in a mixing bowl; add apples. Mix flour, salt, baking powder, and cinnamon in a separate bowl; add to apple mixture and stir just until evenly combined into a thick batter. Pour batter into the prepared loaf pan. Bake in the preheated oven for 45 minutes. Cover loaf pan with aluminum foil; continue baking until a toothpick inserted into the center comes out clean, about 15 minutes more. Cool in the pan for 10 minutes before removing to cool completely on a wire rack. This recipe was a amazing! The bread came out perfect, with a crispy crust and moist inside. I used red delicious apples, and I doubled the cinnamon, but that was all I changed. Overall great! This was fantastic. I used two mini loaf pans. I cut waaaaay down on the sugar using 1/2 cup Brown sugar and about 3/4 cup white. I also added in 1 cup of rhubarb. It's delicious!